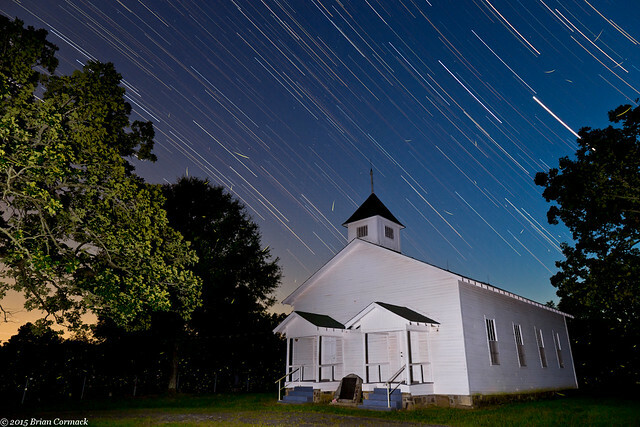 A few weeks ago (I'm way behind on posting, my apologies to my two readers) I headed out to try to take star trail pictures at an old church in the small community of Cato, Arkansas. The conditions were great, it was perfectly clear outside without a trace of clouds. 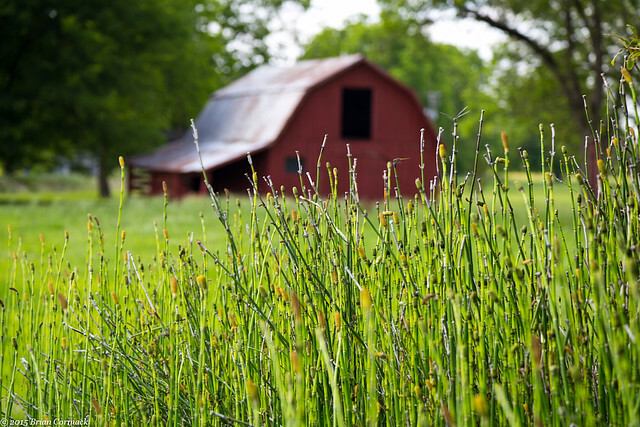 I headed to Cato, which is actually located just north of Little Rock, on the Pulaski and Faulkner county line. Cato was once a thriving little town, and the church here was built way back in 1880. But the town declined sharply in 1940 when the Army bought all of the land surrounding Cato for Camp Robinson. The base cut off access to most of the town, and the population dropped. The church closed in 1962, but it is still maintained and is in good shape. This shot is about an hour's worth of star trails above the church. There is also a lot of activity at the bottom of the shot, with little streaks of light from fireflies. The other weekend we traveled east again, in order to attend a friend's wedding in Nashville (congrats Mel and John!). And between wedding stuff and visiting with other friends, we managed to sneak in a few minutes for some sight-seeing. On Saturday we visited Centennial Park and the Parthenon. Built in 1897 for the Tennessee Centennial Exposition, the Parthenon is a full-size replica of the original one in Athens. The Parthenon is the only building still standing from the Expo, and is now an art museum. The park was packed with people, with it being a nice warm June day. But getting photos of the Parthenon was a bit difficult. There is some construction work going on around the building, so it's nearly impossible to get a shot of it without including construction fences or Port-o-Potties. 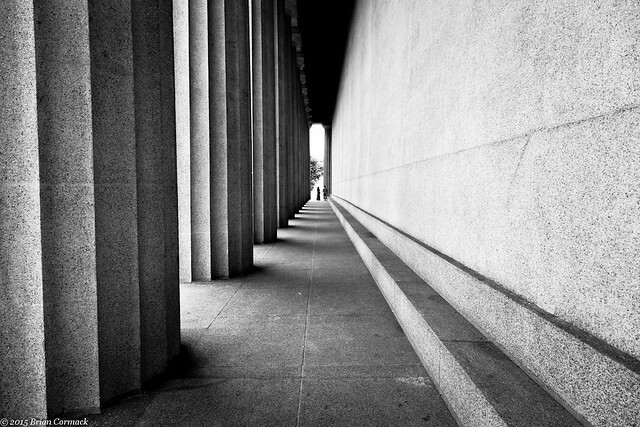 So this is the view from under the columns on the side of the Parthenon, stretching off towards the distance. The next day, before heading back home, we stopped at the Shelby Street pedestrian bridge over the Cumberland River. The bridge was built in 1909 and converted into a pedestrian bridge in 2003. 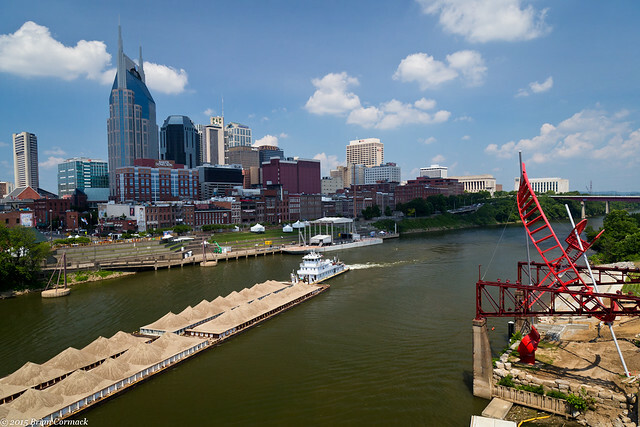 It is usually busy with tourists since it connects the honky-tonk country music part of downtown Nashville to the football stadium across the river. 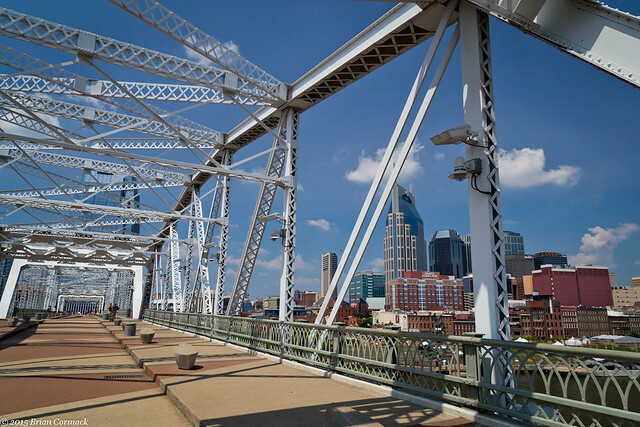 The bridge also provides a great view of downtown Nashville as well. 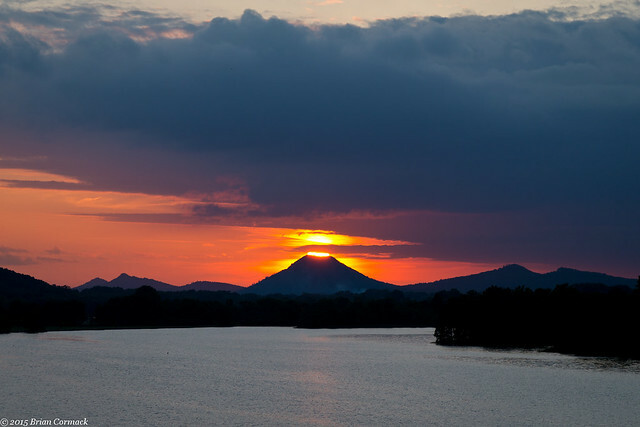 A few times every year, the sun is positioned in a certain way so that it sets directly above Pinnacle Mountain. 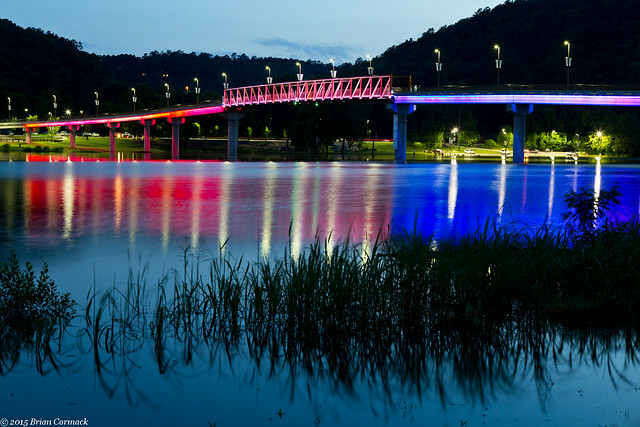 The best places to see this happen are on the pedestrian bridges over the Arkansas River, the Big Dam Bridge or the Two Rivers Bridge. So the other night I headed out to Two Rivers Park, and met up with Zack and John. The sun was just about to set above the flooded Arkansas River, which had caused parts of the park around the Big Dam Bridge to be closed. From this angle, Pinnacle Mountain can look almost like a volcano (it's not!). And when the sun sets directly on top of it, it almost looks like it is erupting. And a view of the bridge from Two Rivers Park, with the flooded river in the foreground. We weren't the only ones at the bridge. A low cloud of bugs descended on the bridge, which if it happened in Egypt during biblical times might have been more worrisome. 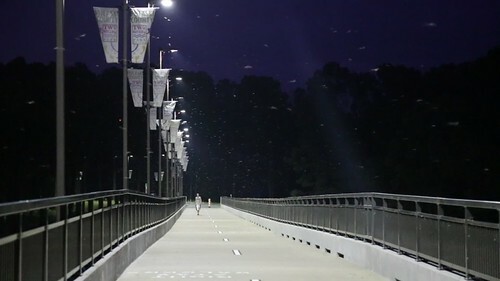 Maybe the flooded river displaced them, or maybe bugs usually flock over the bridge this time of year? But they were out in full force that night. I took a video just to show it, as the bugs looked more like snow. The people walking on the bridge didn't seem to enjoy it, but the spiders probably did. There were a lot of webs built on the railings on the bridge, and the spiders must have enjoyed a feast that night. A few weekends back, my wife and I made the short drive to the small town of Keo to look around at some of the antique shops there (trying to find stuff for the new house). Keo is a neat little place, filled with a lot of quaint old buildings. This old barn actually sits right in the middle of town. In fact Charlotte's Eats and Sweets, the famous pie place, is nearby. Over Memorial Day weekend, I headed out to get a few pictures of the Riverfest fireworks show over downtown Little Rock. I went to a spot on the edge of downtown, far from the thousands of people crowded along the river. 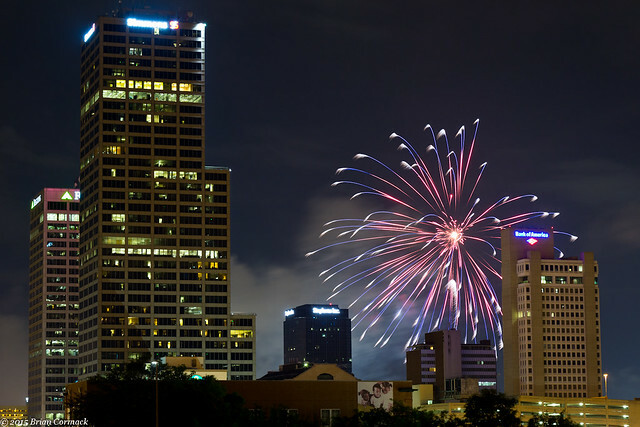 The spot I went to provides a nice view of the skyline, and is at an angle where the fireworks pop right in between some of the skyscrapers. But it is also right next to Mount Holly Cemetery, which is a slightly creepy place to be at night waiting for a fireworks show to start.